Welcome to the next segment of our 2019 #TravelTuesday series: Traveling with Grace. Today Grace heads to Washington State! Tacoma and water-front, view from Tacoma Building, c. 1919. Courtesy of the Library of Congress. August 3, 1924: Left Portland this morning at 10 o’clock and arrived in Tacoma at 3:10 P.M. Went to Hotel Tacoma very prettily situated overlooking Puget Sound. Our room faces a beautiful little garden and there is a lovely vine shaded porch heading down to the garden, a rustic summer house, big holly tree, pool of goldfish and huge birdcage with 8 canaries. We rode around Tacoma from 5 to 6:30 P.M. The city although smaller than Portland, has a wonderful harbor and industries similar to the former city. It has a thriving air and there is much building going on. We saw some very beautiful homes, including a number of solid stone structures quite unusual for this part of the country. The flowers are more profuse and varied than those in Portland and the schools are quite imposing like those in Calif. One of these (begun for a hotel) has a remarkable stadium overlooking Commencement Bay. The Scottish Rite Temple is another fine building. Two beautiful parks are Point Defiance with a fine collection of animals, birds and flowers and Wright Park with fine trees and shrubs, the gift of an old lady. Foot of the Nisqually Glacier and source of the Nisqually River, Mt. Tacoma or Rainier, Washington, 1906. Courtesy of the Library of Congress. 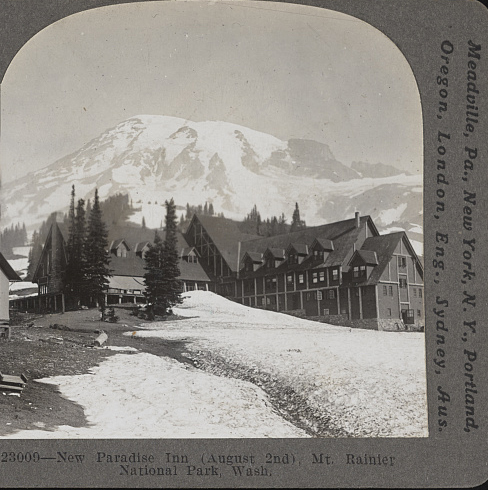 New Paradise Inn, Mt. 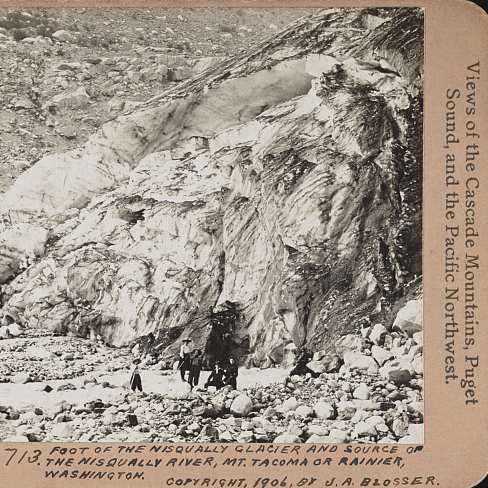 Rainier National Park, c. 1918. Photo by Keystone View Company, courtesy of the Library of Congress. We arrived at Paradise Valley at 2 P.M. We climbed 3000 ft. in 4 miles. At Paradise Inn we find ourselves in a little green, flower starred valley between two ranges of snow-capped mts., the Cascade and Tatoosh. The wild flowers are beautiful, red, blue, pink, lavender, purple, yellow and white. In front of the Inn is Mt. Rainier, 14,500 ft. like a proud monarch with a pearly crown lording it over all of the lesser peaks. The clouds of mist pass backwards and forth over its surface as though they were playing hide and seek. There is a column of steam rising constantly which they say comes from an extinct volcano. In the rear of the Inn is a very pretty fall of water known as Sluiskin Falls. The deer and chipmunks scamper thru the camp and are very tame. The interior of the “Inn” is attractively decorated with logs and thick wooden beams. Everything possible is constructed of wood even the drinking fountain and mail box are hollowed out of the stumps of trees. Some of the tables and chairs made of Alaskan white cedar are very pretty as this wood takes on a beautiful glossy polish making it look as if it were enameled. Mt. Ranier, c. 1925. Photo by Haines Photo Co., courtesy of the Library of Congress. We passed a grove of these trees on our way up. It is called the Ghost Forest as nearly all of the trees are dead, and they look like they are covered with frost. There is always a big log fire burning at either end of the long lobby and the warmth is quite acceptable. Today we met some old friends, Mr. and Mrs. Goldsmith of Washington, and spent some time chatting with them. Mother and father took a hike up the mountain this morning and brought me back a snow ball. I stayed in the Inn and talked to a Mr. Garner from Newport News. In the evening there is a very nice entertainment, instructive pictures in the Guide’s House followed by songs and dancing in the main building. Everyone tells us we have been exception, really lucky in having such perfect weather all the time we have been here, as just before we came there were four gloomy days when the mountain was not to be seen. At times the mts. look very red as tho splashed with a dark rust-colored paint. That is the iron ore. The mt. streams are milky in color due to the constant churning of the waters. But the little lakes here and there are as clear as crystal and reflect everything about them. We left the Inn at 3 P.M. The ride down was slightly different form the upward trip. The further one descends, the mightier the mt. looks up above and one gets a more comprehensive view of it. We reached Tacoma at 6 P.M. and continued on thru Puyallup a fine fruit and berry country, past some lovely farm and dairy country and arrived at Seattle at 8 P.M. Had dinner at the New Washington. Pergola, Volunteer Park, Seattle, 1920. Courtesy of Seattle Municipal Archives via. August 8, 1924: Met Cousin Nathan Hecht at the Washington this morning. We moved to the Hotel Townan[?]. This afternoon we had a very interesting ride thru the city, the downtown business section, big community markets, lovely department stores, then out to the residential district in the north and northwestern direction and high up on the hills. The situation is quite similar to San Francisco. We saw the Government canal and locks connecting Lakes Union and Washington, both fresh water lakes but connected with the ocean thru Puget sound. The locks are built after the plan of those at Panama only much smaller. The homes here as elsewhere in the west are broad, with large porches and flower gardens. Mountain ash trees abound. We rode thru the campus of the University of Washington, 153 acres, with buildings in the Tudor-Gothic style. Also a big log cabin built of Douglas firs left from the Exposition. Not a single nail was driven in this building, the whole having been put together with wooden pegs. We rode thru Volunteer Park a pretty artificial park with sunken flower gardens, Japanese tea gardens, a zoo, etc. and Woodland Park. We passed a big cedar lumber mill and saw how the lumber is graded and sorted. The aroma from the drying boards is very pleasant. Tonight we saw a movie, “The Signal Tower.” Seattle is beautifully illuminated at night, electricity being exceedingly cheap around here. August 9, 1924: This morning Mrs. Jack Kaufman and her daughter Adalheit called on us. We took dinner at the Washington. This evening went to a movie. Saw Valentino in “Monsieur Beaucaire.” The picture houses in Seattle are very pretty and they have excellent music. Met a very nice lady (Mrs. Blum) with Cousin Nathan Hecht. Lake Washington Boulevard, 1920s. Photo by Asahel Curtis via. 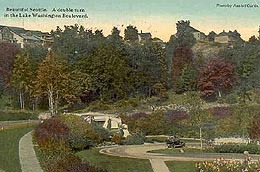 August 10, 1924: Mrs. Kaufman and her son Winfield took us for a drive this afternoon along Lake Washington Boulevard and thru Seattle’s finest residential districts. The homes are very beautiful embellished with landscape gardening. There is excellent swimming in the lake and everywhere [unreadable word???] auto tourist camps here. On our way back to town we drove thru Seattle’s Chinatown. They have a Chinese Opera House here. Mrs. K. is a brilliant woman and I enjoyed my conversation with her. Seattle’s population is a little over 300,000 and it is much livelier than Portland tho not much bigger. It is framed in the Olympic and Cascade ranges with a network of lakes all about it. There is one lovely big department store, Frederick and Nelson’s, and a wonderful market.